Heartburn or acid reflux is becoming a common complaint that is affecting so many people nowadays. 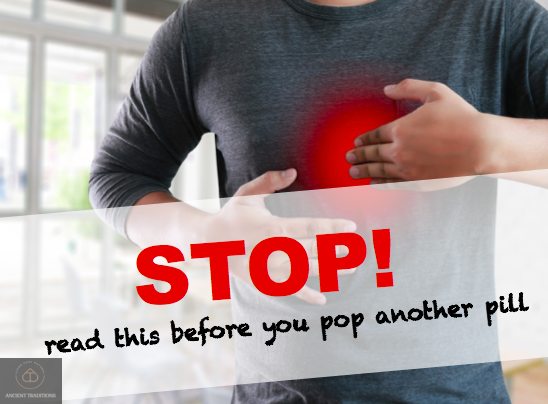 According to the American College of Gastroenterology, 60 million Americans report having heartburn at least once a month (1), and some studies report that more than 15 million Americans have symptoms every day. People suffering from acid reflux or heartburn are usually treated with medication to reduce their stomach acid. So, is too much stomach acid the real cause of heartburn?
. When we eat, hydrochloric acid (HCL) is secreted by the gastric glands in order to break down whole food into nutrients, such as minerals and vitamins, that can be easily absorbed into the bloodstream. Hydrochloric acid is key to absorption of minerals such as copper, iron, magnesium, calcium and zinc, as well as vitamins such as vitamin B12 and folate. If we don't have sufficient levels of stomach acid, food will not be digested properly and subsequently we will not be able to absorb the minerals and vitamins that we need for our body to function properly. Mineral and vitamin deficiencies are associated with a myriad of diseases, including anemia, depression, cardiovascular diseases and autoimmune disease.
. Stomach acid is needed for the breakdown of proteins and thus the absorption of amino acids into the bloodstream. A lack of amino acids may lead to depression, insomnia and anxiety. Furthermore, if some of the undigested protein enters into the bloodstream, our body's defense system will regard them as enemies and generate an immune response to get rid of them. 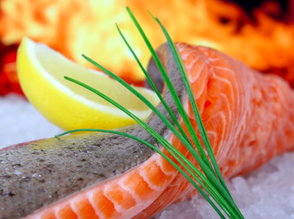 This immune response may then contribute to food allergies and autoimmune disease. In his book, Why Stomach Acid Is Good For You, Dr. Jonathan Wright, states, ’Although genetics are a factor, people with autoimmune diseases such as lupus, rheumatoid arthritis, type 1 diabetes, and many others very frequently have low levels of stomach acid, poor digestion and many food allergies that serve to aggravate their conditions’.
. Most bacteria can't survive at a pH of three or less; the pH of our stomach acid is between one and two. Which means that we need adequate amounts of stomach acid to prevent bacterial and fungal overgrowth. In a recent study, 30 people were treated with an acid reducing drug for at least three months. At the end of the study 11 of the 30 patients developed significant bacterial overgrowth (bad bacteria growing where they shouldn't).
. When we eat carbohydrates our pancreas produces digestive enzymes to break them down. If we don't have adequate amounts of stomach acid, the pancreas will not be stimulated to produce these digestive enzymes. Those undigested carbohydrates become fermented by the bacteria that overgrow in the gut, leading to bloating and gas. Huge amounts of GAS! In his book, Heartburn Cured, Dr. Norm Robillard mentions that 30g of carbohydrate that escapes absorption in a day could produce more than 10,000 mL (ten liters) of hydrogen gas. Does too much stomach acid cause acid reflux? Studies show that as we age, we start to produce less stomach acid. 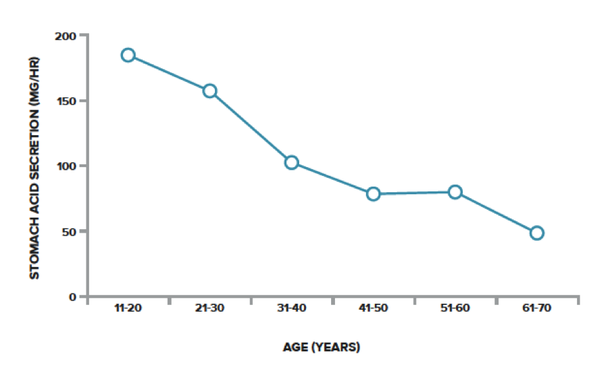 According to the University of Manchester researchers, we tend to produce low stomach acid as we age (2). Moreover, in 1984 researchers found that 60 percent of Japanese men and women over 50 years age suffered from the absence of stomach acid. If too much stomach acid was the main culprit, then according to these studies older people shouldn't suffer from acid reflux, which is not the case. How is acid reflux triggered? We have a muscular valve called the lower esophageal sphincter (LES), which opens to allow swallowed food and drinks to pass into the stomach. The LES valve is supposed to shut down immediately after swallowing to prevent any acidic stomach juices from reverting to the esophagus. Scientists believe that if for any reason the valve malfunctions and opens when it's not supposed to, stomach acid can pass through it even if we only have a very small amount of acid in our stomach. In other words, we can have very little stomach acid, yet suffer from acid reflux. How can low stomach acid lead to acid reflux? Low levels of stomach acid lead to both the overgrowth of bacteria in the gut and the improper digestion of carbohydrates. When these two culprits combine together, the bacteria feed on and ferment the undigested carbohydrates. The fermentation produces huge amounts of gas, which in turn increases the pressure on the low esophageal sphincter valve. The valve opens and acid passes causing heartburn. Simple as that! Low stomach acid is implicated with a number of health conditions other than acid reflux including cancer, depression, autoimmune diseases, asthma, acne rosacea and more. How to test your stomach acid levels? This test works by using a small capsule with a specific wireless electronic transmitter that records the pH of the stomach as you drink a solution with small amounts of baking soda. Considered the gold standard test for low stomach acid and is quite expensive.
. Low Chloride Levels: Levels under 100 are considered low.
. Low Phosphorus Levels: If phosphorus levels are low, with a vitamin D deficiency and/or hyperparathyroidism then it may be a sign of low HCL production.
. High BUN Levels: A lack of stomach acid may result in a high amount of nitrogen waste in the bloodstream. This can be seen as a BUN (blood urea nitrogen) level of 20 or more.
. Abnormal Serum Protein and Serum Globulin Levels: Serum protein under 6.9 or over 7.4 g/dL and globulin level under 2.4 or over 2.8 g/dL could be a sign of low HCL.
. Abnormal MCV/MCH/MCHC: MCV lower than 85, MCH lower than 27.7% and MCHC lower than 32% could indicate iron deficiency associated to low stomach acid. This test can be easily done at home. Though it is not as accurate as the lab tests, it is very cheap and can give you an indication of what's going on inside your stomach. The test works by creating a chemical reaction within your stomach that occurs when you mix the negative ions of the baking soda with the positive hydrogen ions in your stomach acid. The reaction should produce carbon dioxide gas which will cause a burping effect. 1. Mix ¼ tsp of baking soda in 1/2 cup of water, first thing in the morning before eating or drinking anything. 2.Drink the baking soda solution. 3. Time how long it takes for a burp or belch to come about. Go up to 5 minutes. If you have not burped or belched within 5 minutes then it would be a sign of low stomach acid. It is best to repeat the test for three consecutive mornings to check for an overall average. Eating the right kinds of foods can affect the amount of acid your stomach produces. Supplement your daily diet with more fermented vegetables, ginger, noncitrus fruits، turmeric, vitamin C, essential fatty acids, chamomile and healthy fats to reduce symptoms of heartburn. Avoid coffee, aspirin, carbonated drinks, sugar and onion. 1. We need stomach acid to break down food and absorb nutrients such as minerals, vitamins and amino acids. 2. Stomach acid makes our gut an inhospitable environment for harmful bacteria. 3. Heartburn is a symptom of low stomach acid. 4. You can't absorb food nutrients without adequate amounts of stomach acid. 5. Low stomach acid symptoms include vitamin and mineral deficiencies. 6. The Baking Soda Stomach Acid Test can be easily done at home.